Derbyshire is renowned for being a hugely diverse county with town and city nestled in breathtaking countryside with industry and leisure working hand in hand. 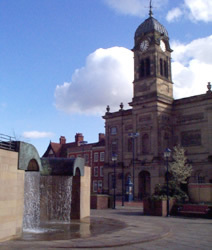 The county's premier city is Derby, which although steeped in history, is one of Britain's youngest cities, being awarded its Charter by Her Majesty the Queen in 1977. Derby has many unique characteristics with a rich mixture of arts, tourism and cultural venues and a pedestrianised city centre, which makes shopping a joy. The Arboretum in Derby was Britain's first public park; it was opened in 1840 at a time when industrialisation and population increased the demand for public spaces. Elvaston Castle Country Park, opened over 100 years later in 1970, was also the first of it's kind. Markeaton Park was originally part of the Markeaton Hall Estate, owned by the Mundy family from 1516. In 1929, Reverend Clarke Maxwell gave Markeaton Hall and twenty acres of its gardens to the Corporation. In 1930 the remaining 180 acres of the park were bought by the Corporation. In 1924 several acres of land, near to Kedleston Road, was given to the people of Derby. On this land a children’s playground was constructed - now know as ‘the Mundy Play Centre'. Markeaton Park was officially opened by the Duke of Kent in June 1931, on the same day as Darley Abbey Park. The layout of the park has changed very little since its opening, other than the area around the Hall itself. The Hall was demolished in the 1960's and was replaced by a landscaped terrace. The Orangery, now a listed building, still remains. The former stables of Markeaton Hall also remain, and are now home to the Markeaton Craft Village, which was set up in 1987. Derbyshire can also claim the first national park to be set up in Britain - the Peak National Park which lies at the southern end of the Pennines, between Sheffield and Manchester, it's boundaries also spread into several other counties. The park covers over 500 square miles, three quarters of which lie within Derbyshire itself. Heading out of the city there is a choice of bustling market towns such as Ashbourne, Bakewell and Chesterfield; and many picturesque villages nestled in unspoilt countryside such as Buxton. Situated in the heart of the Peak District, this beautiful Georgian Spa town boasts the highest market place in the country.